CONICET researchers study changes in the yerba mate processing to optimize energy resources. Coarse grinding yerba mate after drying step (yerba mate canchada). According to the Guaraní legend, Yací, the goddess of the Moon, and her friend Airá, the pink cloud, walked through a thick forest until they suddenly found a jaguar. An arrow pierced the animal before the attack. Yací rewarded the hunter who saved them with a new plant called Caá, which has the ability of attracting hearts of men. In a dream, the goddess explained that he had to prepare an infusion and share it: the yerba mate. That plant has been consumed since past times by Guaraní people, and from then on it became one of the most popular infusions in Argentina, Brazil, Paraguay and Uruguay. Apart from being one of the main crops of the province of Misiones, approximately 300 thousand tones are produced annually. The production process of yerba mate has seven steps before reaching the table: harvest, in which the ripe leaves with branches are generally picked manually. The following step is zapecado (“za” is eye and “peca” is open in Guaraní, this term refers to the blisters that are formed on the leaves), which involves the enzyme inactivation through a quick and direct drying processing. Just after that, there is a drying process in an oven where the rest of the moisture is eliminated until it can obtain 3 or 4 per cent of the original weight. 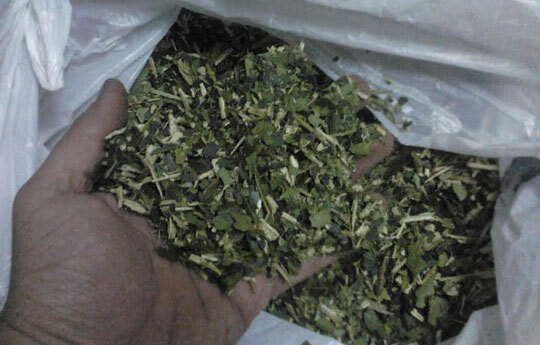 Once the yerba is dry, the following part is the canchado, a big milling and packaging process to transfer it to the places where it is stabilized. It remains there for a variable period between 3 and 12 months until it gets uniform colour, flavour and smell. The last step includes the final milling and later packaging process. Regarding that, Holowaty comments that the current yerba industry is undergoing some economic difficulties related to the production process. “In the province, we do not have natural gas so most of the fuel used is firewood. Until a while ago, the cost of firewood from forests represented less than 1 per cent of the whole cost of the process, but from a change of natural resources policy for the use of renewable forests, there was an increase of 5 per cent in the cost of fuel. Nowadays, yerba industries have a major problem due to the low thermal efficiency of the drying systems”, he affirmed. The chemical engineer referred to one of the current laws in the province of Misiones that is about to be regulated and establishes a regulatory framework for the use of wood energy renewable resources. Law XVI N° 106 states that from 2015 onwards, provincial agro-industries should substitute completely the consumption of firewood of native forests and replace it with wood from implanted forests (mainly pine or eucalyptus) or with other alternative energy sources. The yerba mate’s leaves demand 45 minutes drying whereas the sticks need more than three hours. This difference in drying time makes energy efficiency of the yerba mate processing very low. Regarding that, the researcher explains that another problem is the potential presence of undesirable compounds that could have a negative impact on health due to the type of drying process that has direct contact with flue gases with the product. “Legislation problems regarding the regulation of the use of native forests and the presence of potential toxic compounds for human health were first reasons to study optimization of energy resources in the processing. We study the viability of an alternative process for the traditional method and we aim to replace it by other procedures that develop the same type of product”, Holowaty states. The alternative offer is the implementation of drying systems and zapecado with hot water and steam as well as the use of exchangeable hot systems that enable smoke-free products and reuse gases that now are thrown into the atmosphere. In the traditional drying process, the moisture from the leaves is really low and the temperature is upper than 90º C. This important flow of flue gases could be reused and circulate in the drying sheds. Furthermore, as there is no direct contact with the leaves of yerba mate, there are other fuels like sawmill waste – chips, shaving and sawdust- that can be used. In the past, they were not considered because combustion gases generated by them in contact with the product change the flavour and smell. “The production process is quite traditional due to the fact that most of them are family enterprises and the techniques are not easy to change because they want to keep the quality of the product. Our greatest challenge is to modernize the processing. We are working with two drying sheds that have prototypes in the physicochemical quality control. At first, there are not big differences between the traditional method and the alternative one, so in this first stage, we have to establish the sensory tests to prove whether there are differences in the flavour between the zapecado with direct contact and the steam process”, the chemical engineer comments. The project has a second part where the main objective is the development of a software that simulates the drying process of the yerba mate and helps to find the best conditions for the drying. For that reason, the researchers measure the variables of three drying sheds to perform a simulation of the operation process in the computer. They will thus obtain a benchmark to prove if it is possible to make air circulate or to use heat exchangers. “This alternative has several advantages, firstly the current law enforcement and the possibility of optimizing a processing that is no longer efficient. Only 15 per cent of what is burnt is used to dry, the rest is lost in the atmosphere. Secondly, we could reuse that energy that we are now losing due to the system and the last advantage is to obtain a clean product free of smoke”, Holowaty concludes.